We met up with some friends at an interesting restaurant last night, which I'll tell you about tomorrow. Today I have to share this photo of one of the most beautiful sunsets I think I've seen in Cape Town (which, to be honest, is a really tough matter to judge!). The photo doesn't really do the view justice (it's so difficult to capture exactly how the light was) but perhaps what the picture will do is allow you to understand why we love this part of the world so much. We arrived at the base of the towering Table Mountain and Devil's Peak about 10 minutes after taking this shot. The light changed to bright orange and pink and then slowly started to fade. Cape Town's summer sunsets really are the best. 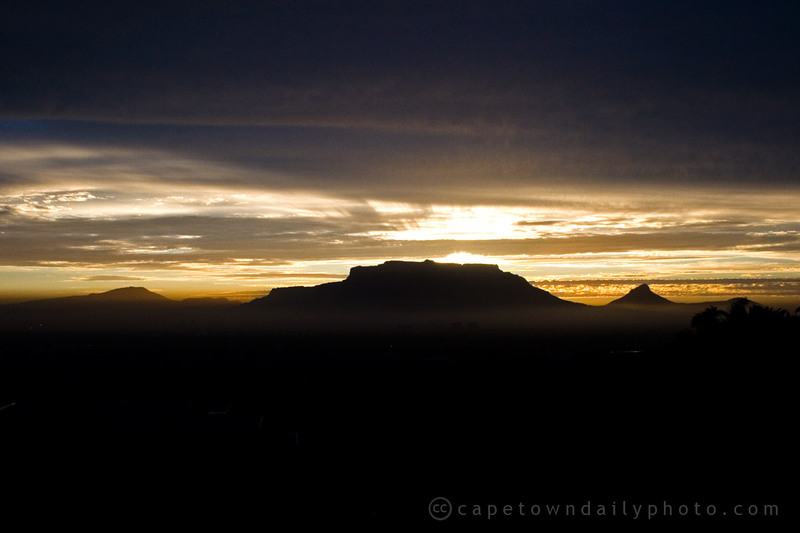 Posted in Landscape and tagged sunset, table mountain on Sunday, 29 November, 2009 by Paul. Definitely one to be printed – superb photo Paul and I just hope that I will get the chance to take one of a sunset as good as this..